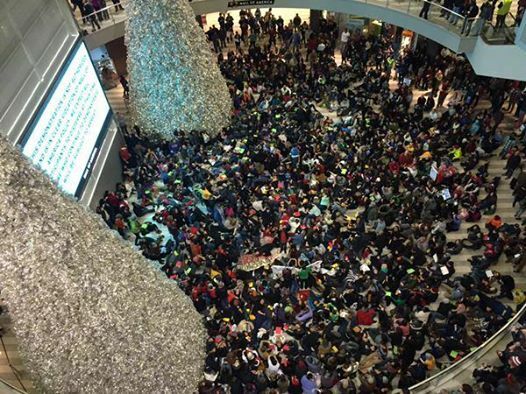 Over 3000 protesters gathered in the Mall of America Saturday in support of the BlackLivesMatter movement. Image via Facebook. As the crowd grew stronger in unison, the reaction throughout the mall varied. Some shoppers stopped and went to the hallways of the four levels overlooking the rotunda to see what was happening. Some scurried away, bags in hand, hoping their day would not be delayed. Others appeared to be confused or indifferent. Within 6 minutes of the start, a message board over the rotunda carried the words of warning as a voice came over the mall’s public address system. “This demonstration is not authorized…” the message began. The rest was lost as the crowd shouted louder and drown out the rest of the PA announcement. One observer told Occupy World Writes that the people on the various levels that joined their voices to the protests seem to have confused the mall police. They did not appear to have considered that reaction, as their first tactic appeared to have been to cordon off the gathering in the rotunda, yet this development caused that strategy to become ineffective. 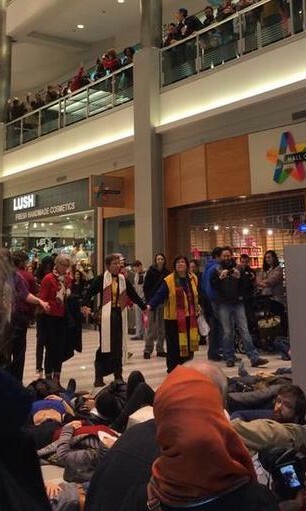 Clergy formed a line between protesters and police in support of the peaceful demonstration. Image via Facebook. Events eventually moved outside, and dispersed. Organizers of the event call the action a victory. Local media reaction is mixed, with the message getting lost by most of them. With a total of 25 arrests made from a crowd of well over three thousand protesters, one news anchor asked why “so few” had been arrested. None of the local media outlets reported the message the protesters were attempting to communicate save one, none of them reported any of the statistics that reveal the reason behind the rage, none of them reported that public awareness of the issue is the first step toward change, none of them reported the local ratio of race in communities and the officers serving those communities. Much like the Occupy Movement, the mainstream media appears to have the same concerted effort to ask only what will make the protests stop so all can go back to “normal.” The question of what is acceptable for “normal” needs to be asked before we can consider returning to or acquiescing toward it. Until the general population comes to understand why these things occur, there will not be an end. With the way things have been going the last few years, we would even guesstimate an escalation in actions like these by groups across the country before we see them cease. The “save one” media outlet we did find that covered this correctly was City Pages. The coverage they did speaks for itself. Here is a link if you’d like to read more. We admit we did not read every publication that covered this event, so we realize there are other outlets that could have been as accurate as this one. It appears that more than Mall of America security and Bloomington City Police were present. Uniformed sheriff department representatives from Carver county as well as Scott county were seen, while the MOA actually is located in Hennepin county. 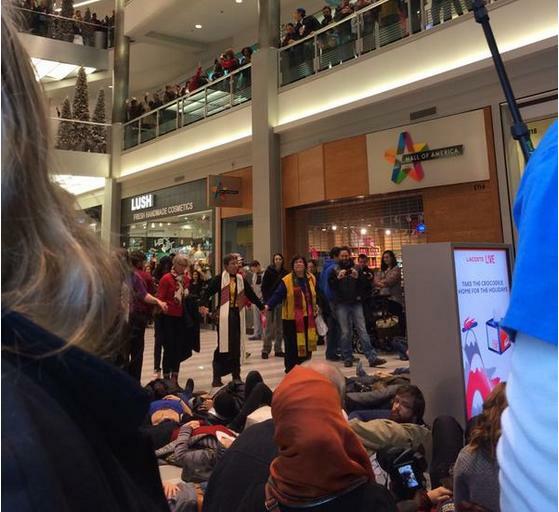 It is reported that approximately 100 officers were at MOA for the protest. Also witnessed by an observer was mall staff with cameras taking pictures of the protesters. The mall is threatening the protesters with a one-year ban on access to the mall, which we will be curious to see how enforcement will take place in a facility that currently does not have any security screenings at the entrances. Will it become like going through an airport security gate to enter the Mall of America? Prior to the protest, MOA management sent a letter to the organizers of the protest, citing policy and private property rights as their reason to not allow the protest. We have two responses to this: 1) when you invite the public openly into your property on a daily basis to do business, visit entertainment venues and dine at restaurants, you subject yourselves to how the public reacts in large groups, gatherings and places where the perception of public property becomes part of the invitation. 2) when you are managing the largest shopping mall in the country, should you not understand your facility is a symbol of more than just your capitalism, and as such, it becomes part of the national conversation at times like this? Lastly, we are saddened by the ignorance of many people who are completely unaware or so self-focused that they never thought BlackLivesMatter in Minnesota. We are even more impressed with the work and dedication of the organizers of this event, and sincerely look forward to their next action, because we believe this community, like so many, has not yet learned what this movement is truly about. How big is MOA? Big enough to hold over 3,000 protesters! Image via Facebook. Filmed by Sam Wagner for Radical News Media, here is a link to the full action. 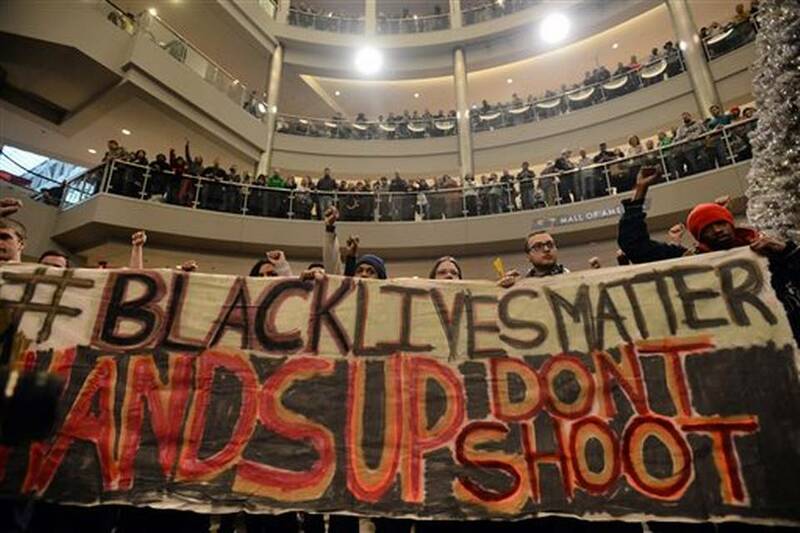 This entry was posted in Civil Rights, Demonstrations & Protests, Economics, Media Issues, National Security vs Police State, Social Justice, Solidarity and tagged BlackLivesMatter, Democracy, Equality, Mall of America, Police Brutality, Protests, Riot Police, Solidarity on December 21, 2014 by MNgranny. I am very heartened to see this actually happened. The fact that others spontaneously joined in is the most heartening of all. The fact that corporate media will under/misrepresent this is irrelevant. We’re not at critical mass yet but we’re getting there!